Honestly, I put fire and Oreos up there at the top of the cool-stuff-humans-have-made list, but I do agree with the heart of Ida Thomshinsky’s Google ebook Socks: socks are a wonderful thing that have been a long time in the making. Let me stop you before you go searching this post for a point other than “socks are pretty great” – there isn’t one. I have simply had socks on my mind lately, and I decided to write about them. There is agreement within the sock community that socks in one form or another have been around since ancient times, when our ancestors gathered animals skins up around their ankles to warm and protect their feet from the elements. We moved on to a matted fur model with the Greeks in the 8th century BCE, and by the turn of the millennium the Romans and Celts were donning fabric leg coverings on their continental jaunts. 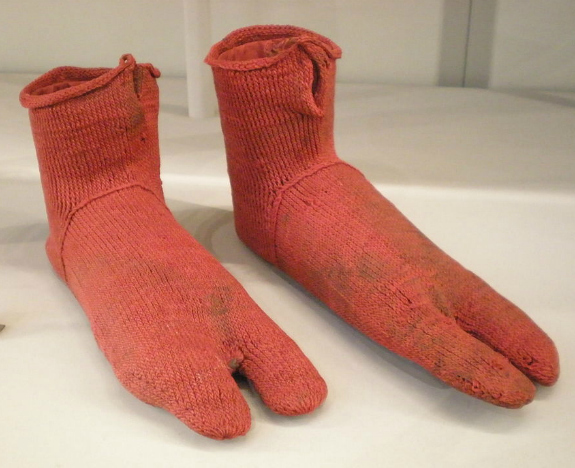 Egyptian socks made between 250 and 420 CE! Knit socks, the forefathers of those we wear today, were first discovered in Egyptian tombs dating as early as the third century CE, but it wasn’t until the 16th century that the first knitting machine came to be and introduced knitted hose to the masses. Now, even the common folk could afford wool and eventually cotton stockings, though silk was still the foot covering of choice among the wealthy. Hosiery changed here and there with the whims and fashions of the European elite (wearing a different coloured stocking on each leg was once the fashion, not the accident), but the next revolution took place in 1938 with the invention of nylon. This blended yarn hit the hosiery market in 1940 and knocked the socks off of (you knew it was going to happen) the silk industry. Headed by Connecticut merchant Joseph Smithson, the Bureau of Missing Socks handled all sock requests and purchases for Union Army during the Civil War. Determined to lower costs and maximize the use of each and every sock, Smithson pushed for an order that required soldiers in want of a new sock to return an old one, with the understanding that the members of a pair of socks do not wear out equally. This cost-saver did not last long due to pushback from sock manufacturers afraid of losing too much of their business. Smithson’s next order required that soldiers turn in a whole pair of old socks in order to receive new ones, and it was in documenting these transactions that Smithson discovered what we now consider common knowledge: socks are lost one at a time. Unfortunately, Smithson was not able to convince those in the White House that his investigation into the mystery of the missing socks warranted extra funding. Instead, he was able to initiate a program of sock repair and replacement that operated behind the front lines of the war, and he created the field sock darning kit used. Smithson’s economical sock-darning company soon became a repository for sub-par officers, and it was turned over to corrupt civilian control after the war. The story slides into the murky waters of obvious sarcasm and conspiracy theory from here, so let’s cut our losses and move on. How to wrap your portyanki was one of the first lessons new soldiers had to learn. For me, pulling on socks is sometimes hard enough. The Russian army only this past year phased out the traditional portyanki, rectangles of fabric wrapped around the feet, in favour of the modern manufactured sock. Portyanki have been standard in the Russian army since the days of Peter the Great, and their replacement is part of a move to modernize the Russian military. If all of these modern developments have you longing for the days of the good old animal hide foot garment, long no more: you can find leather socks today. But with the volume of sweat the human foot can produce (a pint per day – each), you might want to save those for a lazy day on the couch. Meg, on a rare break from fetch and enjoying one of our other favourite things: ice cream! Pet toys – my late dog Nutmeg had a passion for playing fetch, and she would bring us just about anything she could fit in her mouth with the expectation that we would throw it. For hours. Socks fit this category of anything-that-fits-in-Meg’s-mouth, so we often found our own socks, damp with dog spit, laid by our feet. Meg also tended to carry her toys outside with her and then forget them, so we came up with Meg Socks – socks with a knot tied in them – as a way to satisfy Meg’s endless need for toys and to rid our sock drawers of the lonely socks whose partners just weren’t coming back. Smoke detector shields – for those times when for one reason or another, you are concerned that the smoke detector might draw unnecessary attention to you. Remember to take them off later for safety, though! Heating wraps – filled with rice and microwaved, socks make convenient and cheap neck wraps (I have Mom to thank for this one). Cheesecloth substitute – thin socks or nylons work really well for straining food and liquids, from cheese to kava. Hand protectors – certainly not for reaching into the oven, but they’ll save you some pain when taking your Easy Mac out of the microwave, college students. Please comment with pictures of your own sock drawers, favourite socks, sock stories, and sock uses! My new favourite slipper socks! Note: The few sock resources I managed to find on the internet exhibit a frustrating lack of sources and an abundance of the same information, bordering on plagiarism, which made it difficult to cite each particular fact (or more accurately, each claim). Instead, below I have listed all of the websites that I used and did not link to directly in the text. If anyone knows of more reliable sock materials, please share!